A sweet vanilla-infused lime marmalade to enjoy on toast, warm as a glaze for chicken or pork or use in baking. Wash fruit and drain. Remove blemishes (if any). Cut citrus fruit into quarters. Holding fruit quarters over a bowl (to catch juice and seeds), remove peels and place lime peels into a medium saucepan. Roughly chop the fruit and place into a bowl with the juice and any seeds. Measure the bowl of fruit/juice/seeds into a large, heavy-based pan. Add 1/4 cup water per 1 cup of fruit. i.e. 4 cups of fruit + 1 cup water. Bring to a boil then simmer uncovered for 15 minutes. Puree using a food blender, processor or immersion (stick) blender, if desired. 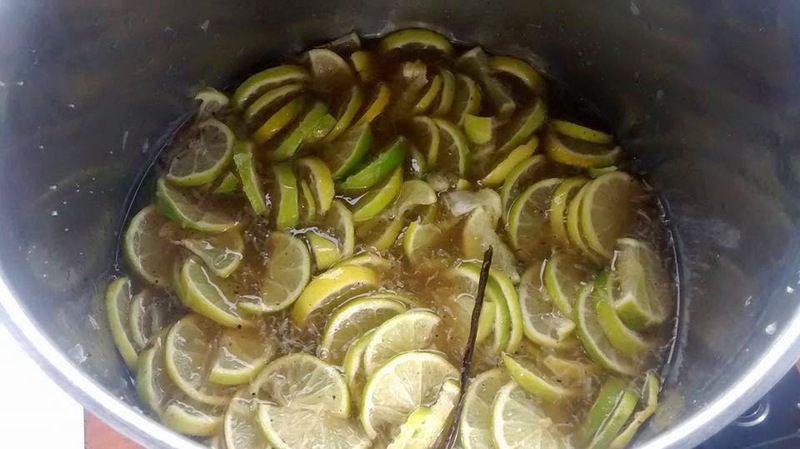 Boil lime peels: 2 x 15 minutes. Cover the lime peels in the medium pan with water. Bring to a boil then boil gently for 15 minutes. Discard water and drain peels well, then cover with fresh water and boil for a further 15 minutes. Drain well. Spread out on a plate (or cutting board) and leave until they are cool enough to handle. Then scoop away the soft bitter white pith and discard, leaving long pieces of the outer peel. Cut into very thin slices, as thinly as possible. Measure fruit puree back into your jam-making pan. Measure the fruit puree back into the pan through a sieve to catch any seeds. Push through the sieve with a spoon to push through any pulp if you like (this will result in a cloudier marmalade). Add vanilla beans (scraped and empty pods included). Add sugar into the pan: 3/4 cup of sugar for every 1 cup of fruit. For example if you have 4 cups of fruit mixture in the pot, you will add 3 cups of sugar. Whisk well to combine, whisking occasionally over medium heat until sugar has dissolved. Then stir in the rind strips and increase heat to bring the marmalade to a boil. Place jars in a boiling water bath canner (or a pot with a round cake rack or a small clean cloth on the base). Cover jars with 1-2 inches of water above their rims, place the lid on the canner and bring to a boil. Then start your timer and boil jars for 10 minutes. Once the time is complete, turn the heat off and leave hot jars in hot water until ready to use. Bring marmalade to a boil. Set the heat to medium-high so it bubbles steadily. Setting (gel) point will take 15-30 minutes, whisking the pan every few minutes. Test using the freezer plate method (30secs on freezer temperature saucer, it wrinkles and doesn't run when angled). At the end you can also add up to 4 tablespoons of liqueur before bottling if you like. While you are filling the jars with hot marmalade, place the lids into the boiling water canner. Do not simmer or boil, just let the lids heat through in the few minutes while you fill the jars, removing the lids from the water when you are ready to place them onto the jars so they stay hot. Ladle hot marmalade into hot jars. 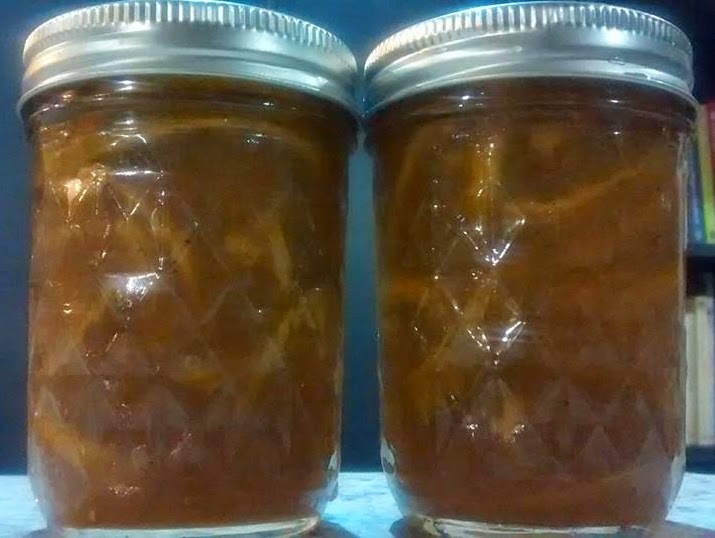 Immediately spoon the hot marmalade into your prepared hot jars: fill to 1/4 inch (0.5cm) from the rim. Remove bubbles, check headspace is correct then wipe rims and seal. Process in boiling water bath for 10 minutes to seal (start timer once water is back to a boil). Then place on a towel-covered bench overnight to seal.